This article on the rebranding of the Bombardier CSeries to the Airbus A220 first appeared in the September 2018 edition of Australian Aviation. 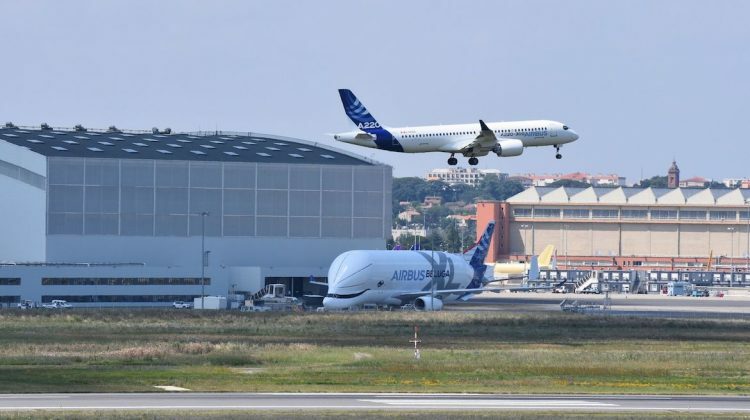 The arrival of Airbus’s newest single-aisle offering, the A220, into Toulouse in July marked the first skirmish in a looming new sales war between the European planemaker and its US rival Boeing. But questions remain over whether Airbus’s decision to take control of the former Bombardier C Series program is a mark of genius, or a big risk. As senior Airbus executives awaited the arrival of their latest single-aisle jet at Toulouse-Blagnac Airport in France on July 10, gathered aviation media from around the world were aware it was formerly the made-in-Canada Bombardier C Series regional jet. What it would be re-christened was anybody’s guess. There was, however, no doubt about Airbus’s new-found enthusiasm for a plane that fits into a sector – the regional jet market – it has, along with rival Boeing, essentially ignored for years. 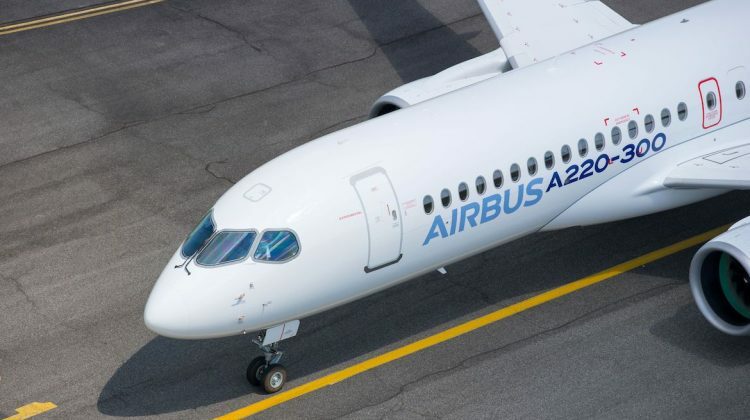 “I need to sell the aircraft and that is my job under the leadership of Airbus chief commercial officer Eric Schultz,” declared David Dufrenois, Head of Sales for the new offering, at a pre-arrival press conference. It is a statement that no doubt will be severely tested over coming years, since selling small jets, particularly in Asia Pacific, has been an uphill battle for both Bombardier and competitor Embraer. What that small jet would now be called was revealed when it performed a low level fly-past above the main runway at Toulouse before landing, resplendent in its new Airbus livery, emblazoned along its fuselage with the new designation, A220. This version was the A220-300, formerly the CS300, a 130 to 160-seater. 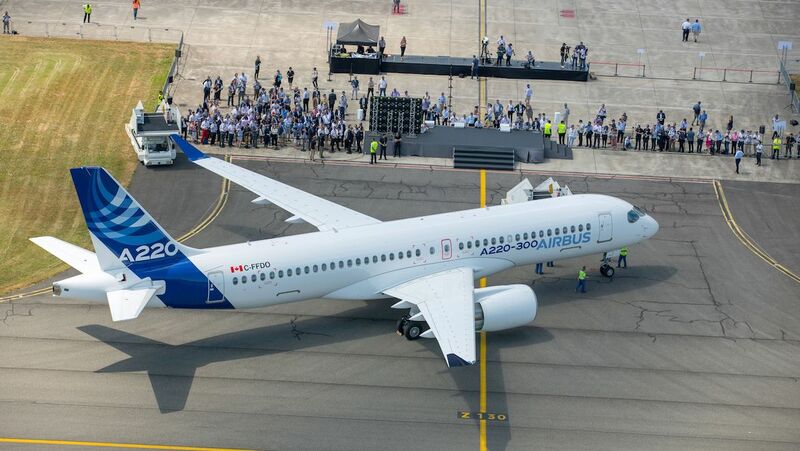 The smaller A220-100, formerly the CS100, fits into the 100 to 135-seat category. According to Airbus, they are a perfect fit below its A320 family models and will soon be rolling off the shelf to enthusiastic buyers. A day later, that certainly appeared a possibility as it was announced US operator jetBlue had ordered 60 A220-300s. And a week later at the Farnborough Airshow another 60 of the same type were ordered for a planned new US start-up in which jetBlue also has an interest. Those sales cemented the conviction of Airbus that some 40 per cent of the demand for the new plane will be in North America. Yet, despite this early flurry, Airbus is well aware the road ahead is fraught with difficulty. What it has bought into is an aircraft that has, thus far, had a rocky life. Bombardier spent more than US$6 billion – US$2 billion over budget – to develop the C Series after launching it in 2008. By late 2015 it was forced to turn to the Quebec Government for a US$1 billion bailout to keep the program alive. Airbus arrived on the scene last year as a White Knight, with a deal formalised on July 1 this year. Under the agreement a new entity, CSALP (C Series Aircraft Limited Partnership) was formed, with Airbus owning 50.01 per cent, Bombardier holding approximately 34 per cent and Investissement Quebec, the government investment arm, around 16 per cent. Although Airbus essentially gained control of the C Series program without spending a cent, the cost of rejuvenating the fortunes of an aircraft that has sold poorly likely will be significant. At the time Toulouse took the reins, the C Series had total sales of 402 with only 38 aircraft in service (deliveries began in early 2017) and a backlog of 364. The production line at Mirabel near Quebec is designed to deliver 120 jets annually, a target that is nowhere near being reached. 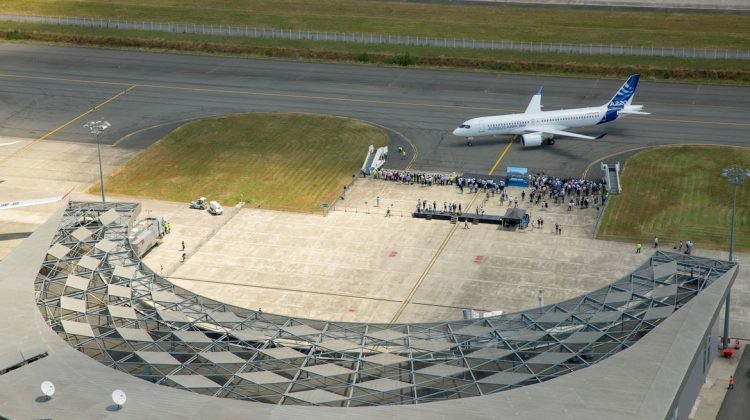 Additionally, a second line being built in Mobile, Alabama (alongside an existing Airbus final assembly line for its A320) will open in 2020 with plans for it to deliver 50 to 60 aircraft a year. 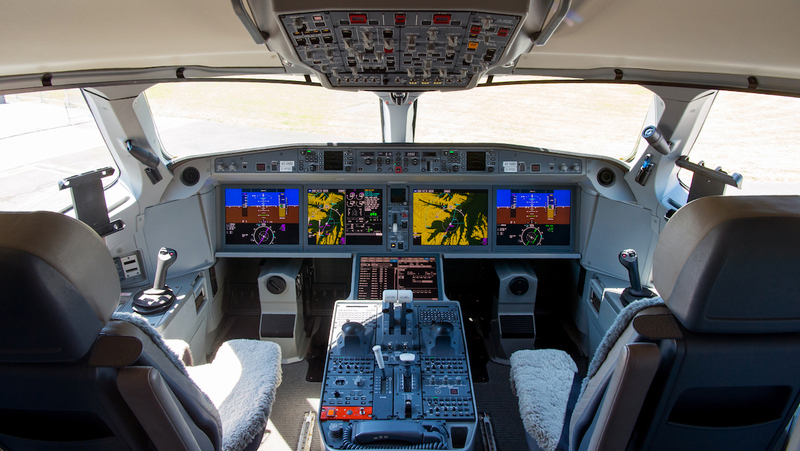 Ultimately, production rates will depend on how successful Airbus is in selling the jet. Cutting production costs on the troubled program will be one of Airbus’s key targets, allowing it to turn out jets at a price customers are prepared to pay. 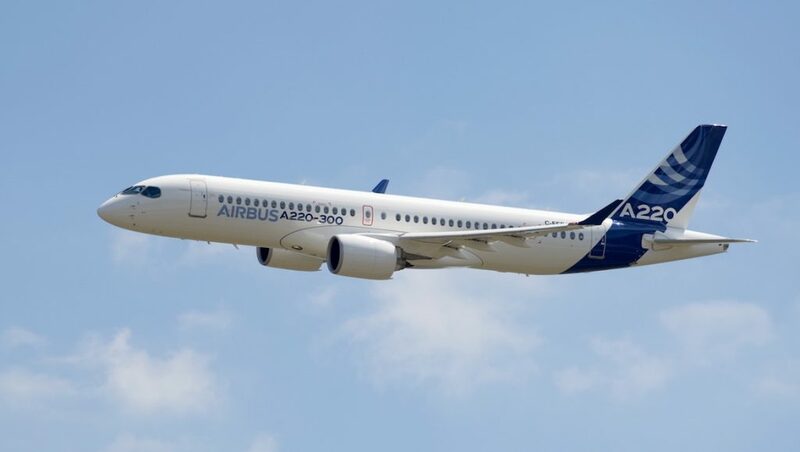 Can the A220 be built at a price the market will accept to buy it? “The answer is yes, of course, because otherwise we wouldn’t continue an endeavor on this program,” explained Dufrenois. Dufrenois says one of the major tasks ahead is to reduce the unit costs of the aircraft. “How we are going to do that in many instances is on the supplier front of course. We are sharing some suppliers with Airbus and of course we will take advantage of our global scale to actually ask a little bit of effort from some of our suppliers on the C Series particularly. Rob Dewar, known as father of the C Series and now head of customer service for CSALP said Airbus brings a world-leading capability to help the program. “They have huge production rates and their ability and network of suppliers is also going to be very helpful. But yes, that is one of the priorities for the program, ramp it up, build the sales. I can see already just in discussions we have had in the last seven months a lot of capability and help that came and of course now we are going to have an additional facility in Mobile which will increase the capacity and help that ramp-up. So what to make of Airbus’s change of tune on the 100-150 seat market, a sector in which its forecasts were previously far more pessimistic than Bombardier’s? There has, apparently, been a reassessment. “As far as I am concerned we see in that sector over the next 20 years – and that includes the C series and the A319neo – 7,200 aircraft, of which 6,100 will be for C Series size,” Dufrenois said. Airbus would expect to get half of these orders. “I don’t think we can be accused of not underestimating this market,” said Dufrenois. 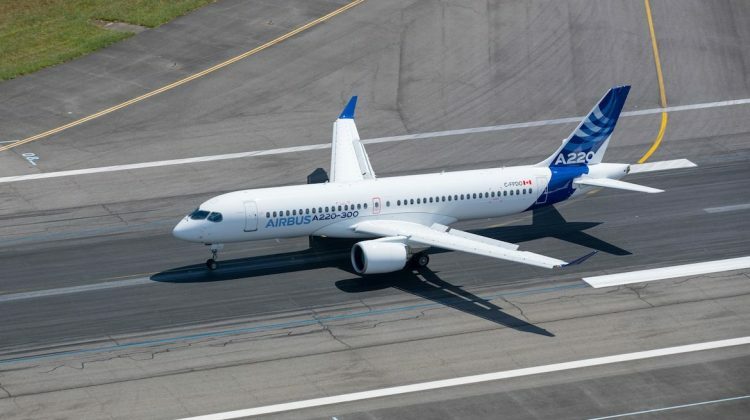 “We did give our colleagues at Bombardier a very hard time when it came to the C Series v the A319/320 competition, to the extent where we actually grabbed a lot of this market. “But that was not actually to underestimate the market itself nor the program. John (Leahy, former Airbus sales chief) said it was a cute little plane and I think he meant it. It is still a cute little plane. The point is at one stage we had to make this decision. Indeed, until now there has been a “grey area” between what are commonly known as regional jets and the single-aisle offerings such as the A320 and Boeing 737. Both Boeing and Airbus have offered aircraft with a size creeping down into the higher end of the regional market. In Airbus’s case its A319 is essentially the same size as the A220-300. Its unloved, even smaller A318 is about the same size as the the A220-100 – when a graph of the Airbus single-aisle family was shown in Toulouse it did not include the A318, which entered service in July 2003 with Frontier Airlines. Relative to other Airbus A320 family variants, the A318 has sold in only tiny numbers with total orders for 80 aircraft placed. The order book is currently empty, and there are no plans to develop an A318neo. But the A319 has been far more successful. As of February this year, a total of 1,469 A319 aircraft had been delivered, of which 1,448 are in service. 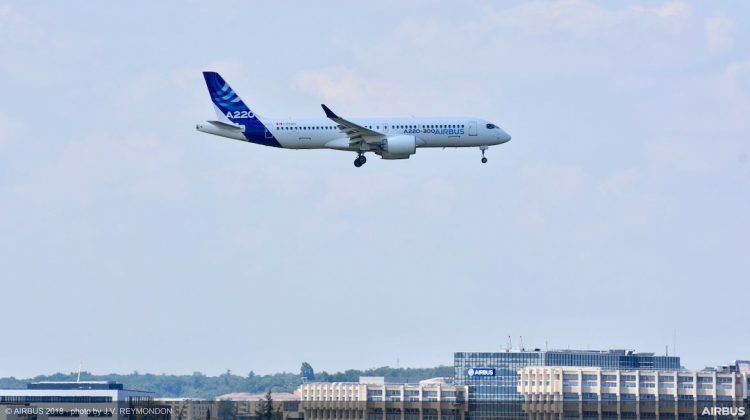 How Airbus intends to formulate its sales pitch to convince customers to choose between the A220-300 and the A319 was not explained. Airbus may talk about full integration but commonality is another issue. This has been a major philosophy of Airbus. It allows pilots to switch easily between different single-aisle types and even into the widebody A330 with short conversion courses. 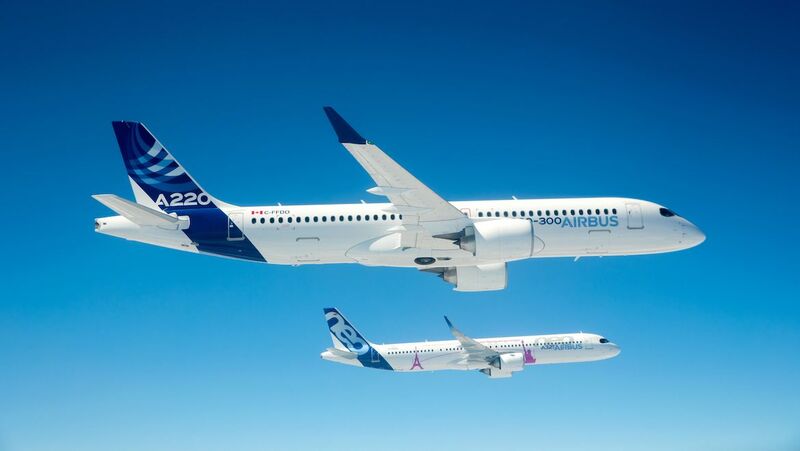 So now that the A220 is part of the Airbus single-aisle family, the question arises: just how much commonality is there? However, he concedes that “at the beginning” there will be no full commonality between the two cockpits, no common type rating, though that is something which can be worked out in the future. Dewar added: “First of all, there are already a lot of similarities in the cockpits, side sticks and similar technologies. There is of course in the future some possibilities to migrate the cockpits but the first focus really is ramping up the program, building sales and cutting our costs and then after we can look at opportunities in development together with the Airbus family. That will not be done in one shot. Also on the agenda at some stage will be introducing the Airbus Airspace cabin design into the A220, though it says this is no big jump because the cabins already share many common traits. There is no doubt the A220 is an excellent aircraft. Powered by Pratt & Whitney’s PS1000G PurePower geared turbofan (which is also offered on Airbus’s A320neo family), it is already showing its versatility. Swiss, for example, operates it into the challenging London City Airport (with its short 1,500m runway and steep 5.5 degree approaches), while Latvia’s Air Baltic flies in sometimes extreme weather conditions. Maintenance is also proving to be extremely efficient. Typically, an A check takes around eight hours. These checks are being done on operating C Series aircraft in three hours. The A220-100 has a range of 2,950nm and the -300 3,200nm. Designed and being certified for 180 minutes ETOPS, all the tests of the aircraft and engines are now completed and documentation has been submitted to the authorities, with certification expected later this year. Airbus does concede that making significant inroads with the A220 into the world’s fastest growing airline market, Asia Pacific, will be something of a challenge. Here, incumbent full‑service carriers, low‑cost operators and start-ups alike have all been fixated on operating either A320 or 737 types in their single aisle fleets. The only customer for the C Series in the region currently is Korean Air, which has six CS300s. Dufrenois said Asia Pacific is probably “not the first market for the C Series” but could still account for 15 and 20 per cent. “It’s still a great market for the 100-150 seater. You are right, the A320 has been very successful in Asia Pacific and still dominates the market. We will probably have to get some start-up, some airline that wants to start afresh with a new model. We will probably try to convince some airlines who have the A320 to try the C series at the same time. 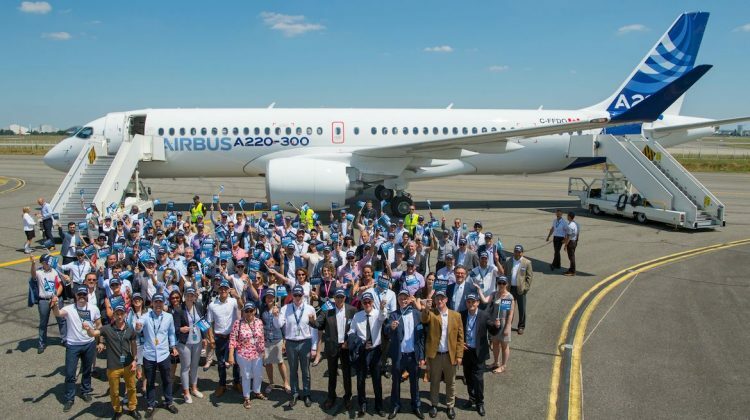 As it matures the A220 program, Airbus knows it probably won’t have the field to itself for too much longer, though it does certainly have a head start. Boeing and Brazilian jet maker Embraer, Bombardier’s major rival, has already announced they are attempting to form a joint venture that would also push the US aerospace giant into the market for smaller regional jets. Under the proposal a new company is being valued at US$4.75 billion, with Boeing owning 80 per cent and Embraer the remaining 20 per cent. That deal, however, is not expected to be finalised until the end of next year but if consummated would see Boeing marketing Embraer’s range of new E2 Jets in direct competition to the A220. Whether the Embraer product would be rebranded under a Boeing brand is not yet known. Boeing exited the 100-seat jet market in 2007 when it stopped building the 717, which it had inherited with the acquisition of McDonnell Douglas. Difficulties aside, there is no questioning Airbus’s new-found enthusiasm for the 100-150 seat market segment. “Combining the state-of-the-art technology of the C Series aircraft with the global scale and reach of Airbus in terms of global sales worldwide, in terms of excellence in industry capabilities and procurement and, of course, in terms of global support network will bring value: value for our customers, value for our employees, value for our suppliers and value for our shareholders,” insisted Dufrenois. “This partnership is good for a lot of reasons. First of all is competition and we do like competition. We believe there is a market in the 100 to 150-seat segment and we are convinced that the C Series responds fantastically to the need of that market. Just how right he is, only time will tell. This article originally appeared in the September 2018 edition of Australian Aviation.